With little fanfare except in Commodore Nation, Vanderbilt started an honest to god winning streak against I-65 rival Kentucky with a 72-67 win in Rupp Arena yesterday. For those of you excepting to see the highlights of the game, or Vanderbilt getting any love from the media after knocking off their second ranked opponent in as many games, you were inevitably disappointed. While Shamas will be posting on the anti-Vanderbilt media bias that pervades the sports media later, suffice it to say that Vanderbilt’s win in Lexington yesterday was a statement win. Beating their 4th ranked opponent in 5 tries this season, Vanderbilt is now a team that demands to be taken seriously. With their next two games at #16 LSU and #1 Florida on the road, Kevin Stallings has his team poised to take a huge step forward in their drive to the NCAA Tournament. If Vanderbilt is able to split their next two, the Commies will significantly improve their chances of dancing in March. Even without a split, yesterday’s win helps alleviate Vanderbilt letting the Auburn and Georgia games get away from them early in the season. As for how Vanderbilt pulled off the upset yesterday, the Commies were 11 of 23 from downtown, and shot 50% from the field. 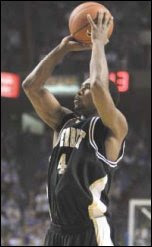 While Vanderbilt was uncharacteristically ineffective from the free throw line (13-20), the fact that they got to the line 20 times is an encouraging sign. Despite being Kentucky’s distinct size advantage, Vanderbilt was only out-rebounded 32-27 and outscored 24-20 in the paint. And, despite Kentucky grabbing 11 offensive rebounds, they were only able to convert those boards into 11 points. 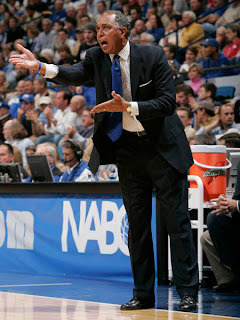 Tubby Smith’s up-tempo defense forced the Commies into 14 turnovers, but those only translated into 8 points. Vanderbilt, on the other hand, was able to turn the Wildcats’ 14 turnovers into 17 points. Shan and Derrick, as usual, led the Commodores offensive charge. Byars scored 23 points on 7-12 shooting, including 4-7 from behind the arc; Foster added 16 points and 7 assists. All in all, a solid win for Vanderbilt. While it is still to be determined if Vanderbilt’s trip to Baton Rouge will be televised, this is a game all Commodore Nation should be focused on. The LSU game as well as the Florida game will be deciding factors on this otherwise schizophrenic team. Picking up a win in Rupp against Kentucky, whether they're ranked in the top 5 or top 50, is huge. Especially considering our history of poor play there. If we can knock off LSU, then we'll have some serious evidence to prove that we belong among the 64. Maybe we can even play Florida to the wire (although that's a much tougher draw). Either way, this is a big time win for us. Vanderbilt's next two games are at LSU and at home against Ole Miss. Vanderbilt will play Florida a week from Wednesday at the O'Connell Center. The LSU game will not be televised, but the games against Ole Miss and Florida will.